The British Medical Association, the national trade union for doctors, pays its workers who clean BMA House the minimum wage of £6-19/hour. The cleaners are demanding the London Living Wage, £8-55/hour. To date the BMA have used the cop out that it is their subcontractor, Interserve, who set the rate of pay. However, the BMA awards the cleaning contract and so holds ultimate responsibility. The BMA Annual Representatives Meeting starts in Edinburgh on Monday 24th June. 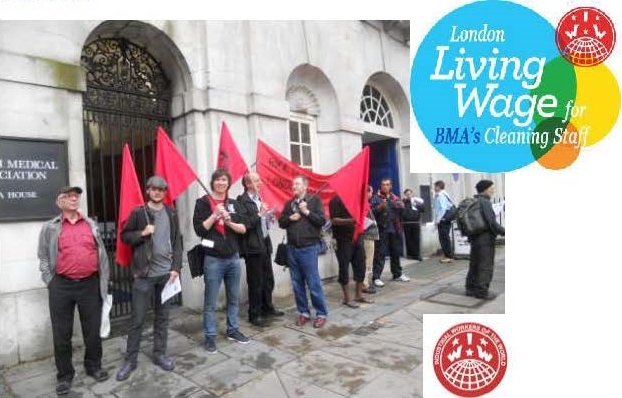 At present the motions have been consigned to the section “unlikely to be reached due to lack of time” so on Friday (21st June) London IWW leafleted outside BMA House to urge BMA members and passes by to help get motions 482 and 483 on the Table. Since the murder of Lee Rigby, various chancers have attempted to use the tragedy as a bandwagon for their own financial and political gain. The EDL leaped at the chance to exploit the murder, setting up Facebook fronts and organised memorial marches in order to expose more people to their anti-Muslim propaganda. Now they’re saying they will march from Westminster to Woolwich in order to get on TV again. Help For Heroes have rejected their sponsorship money so Tommy & Kev will be pocketing it instead. Following on from an arson attack on a mosque in Gloucester on Tuesday morning, two local men have been charged with conspiracy to commit arson and remanded in custody. It’s interesting to note that Clive Ceronne, one of the accused, is a known far-right activist in the local area. He was previously involved with the Gloucester English Defence League ‘division’ as well as setting up and administrating the ‘South West Infidels’ Facebook page. Ceronne is also listed as the Gloucestershire ‘officer’ for the New British Union, you can find out more about him and his fellow fascists here. A CHELTENHAM man has been charged with conspiracy to commit arson following a “hate crime” at a mosque. Ashley Henry Juggins, 20, of Brooklyn Road will appear before magistrates today following the blaze in Gloucester. 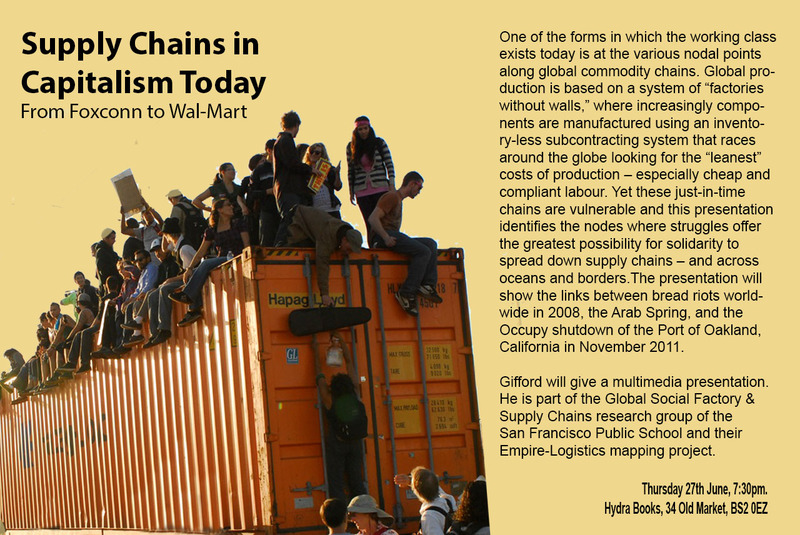 Class struggles in global supply chains: Hydra Books Bristol, 27th June, 7.30pm. 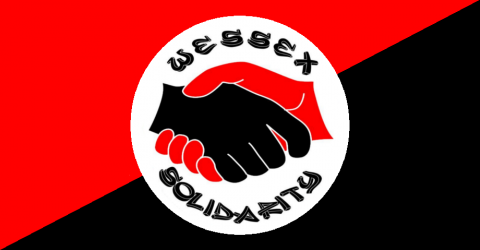 A comrade from California will be speaking about class struggles in global commodity supply chains, at Bristol’s Hydra Books on Thursday 27th June, 7.30pm. Bournemouth and Poole bedroom tax demo’s, a bizarre response. A broad range of activists responded to B.P.A.C.C.‘s call out to picket council meetings in Bournemouth and Poole on Tuesday. In each case, a question was submitted by a resident of the borough demanding an assurance that none of our fellow residents would be evicted over inability to pay the bedroom tax. In Poole, the question was submitted by Kevin Smith; as Mr Smith has recently found employment and is required to work a night shift, he was unable to attend in person. It had been agreed by the council that a comrade would read the question on his behalf but the council went back on this the day before, so only a written answer was given. Demonstrators from Bournemouth and Poole Anti Cuts Coalition, UK Uncut and Wessex Solidarity staged protests against the bedroom tax outside the offices of Poole and Bournemouth Councils this evening. The protest in Poole was in support of a question tabled by Mr Kevin Smith of Canford Heath Poole seeking reassurances there would be no evictions in the event of rent arrears being accrued due to these proposed changes. Mr Smith was unable to attend the council meeting and the council decided any answer would be provided for Mr Smith in ‘due course’. Outside of Bournemouth Council offices where a similar protest was staged sources reported there was one arrest. Meanwhile, in Bournemouth, an even more bizarre situation developed; a Public Question was submitted by Mike Cracknell; during one of the most low-key (not to say boring) protests ever, a local activist was arrested for allegedly chalking this picture on the pavement outside Bournemouth town hall. He was taken away by 4 Babylon including one plain clothes and remained impassive throughout. Subsequently a delegation from BPACC comprising members of Unite, CP, SolFed, non aligned and labour party were denied access to the council chambers apparently on the orders of the mayor’s chauffeur! Our comrade was held 6 hours and bailed, he was not informed that the delegation was waiting for him at the police station. Meanwhile as evictions do seem likely to happen, please put some serious thought into adding your support and involvement in setting up phone trees to physically stop bailiffs from evicting you or your neighbours. We need to self-organise now so we are ready, if and when, evictions begin. Thank you. The June issue of Resistance (Anarchist Paper) is out now, we even have printed copies ready to hand out on the first of the month – and people tell us anarchists aren’t organised! Includes updates on the struggle against the exploitation of Bangladeshi workers, Wildcat strikes in Brighton, Anti-Blacklist campaigners in Manchester and more. If you can’t wait to get your hands on a printed copy (free/donation) you can download the PDF here. 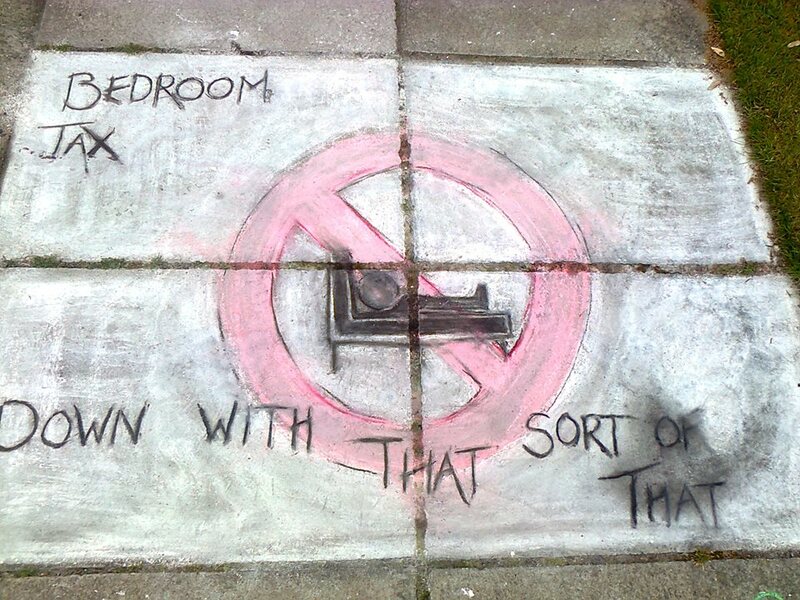 We’ll also be handing some out at tomorrows Anti Bedroom Tax demo at 1pm on College Green. If thats not enough news about working class resistance for ya, then take a look at the Bristolian.